Happening upon this sign at a Walmart in Georgia, Laura B. commented, "Ah, fall. The season when I think of eating APPlES. 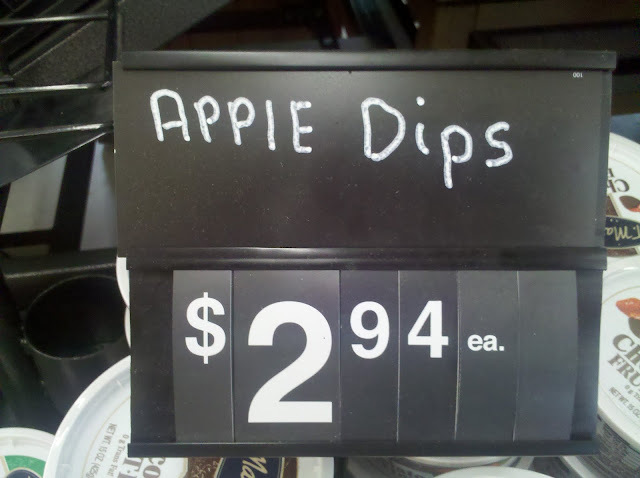 And what's an appie without APPlE DIPS?" Interestingly, the text "APPlE Dips" itself dips, from left to right. Obviously the Dips does not refer to the price of APPlE COMPUTER stock, which recently reached an all time high of $400 a share, far from dipping.